Do you ever fall into the black pit of despair? Have you ever felt like there was no way out? The worst part about it for me is trying to figure out how to find that first foothold that starts the climb out. Hymn #97 has been a powerful stepping stone for me when I need a way out of the dark. Just voicing the words about the “encircling gloom,” and the dark night helps lift some of the mist and see the next few steps forward. For this reason, Hymn #97 is #2 all time favorite hymn. Somehow it acts as a tangible extension of the Lord’s enabling powers of Atonement. The music is beautifully constructed. The melody rises with yearning in the opening passage. Then it dips down into the gloom, like a hand reaching down to lift us up. By the 3rd phrase we’re starting to see some light, and the repeated melody notes seem to me like the first few steady steps in the right direction. The harmony below keeps us afloat and moving forward. There’s one small melodic detail that makes a big emotional impact. One of those “by small and simple things great things are brought to pass” elements. It’s the small multiple syllable notes. “Gloom” in the first line, “home” and “on” in the second line, “ask” and “to” in the third line, and “enough” and “me” in the last line. Each of these extended syllable moments gives the tune extra yearning. The last one, in the last measure is the strongest of them all. You expect to hear the chord resolve on the downbeat, but instead, the gratification of resolve is delayed by one more syllabic extension. The previous chord carries over and resolves to the 1 chord after the downbeat. To support these yearning multi-note bits, the lower voices do their own syllabic extending. There are many moments when the alto, tenor and bass either move between chords or extend a chord when the soprano is holding a long note. These moments, together with the soothing stepwise harmony throughout, give extra potency to the yearning and depict the stepping out of darkness into the light. What a beautiful, calming, atoning hymn. I wrote an arrangement of this hymn for solo string instrument and piano quite a while ago and recently re-worked it for violin, cello and piano. 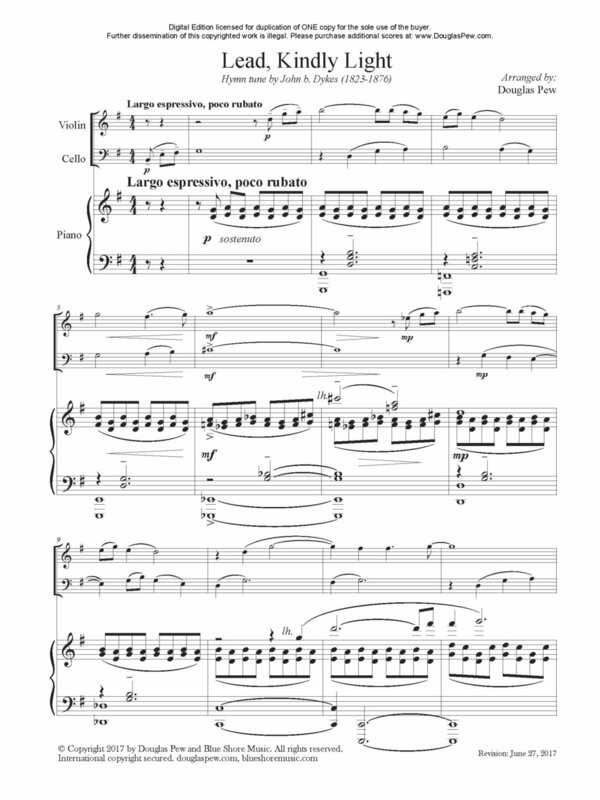 If you’re interested in hearing an excerpt and seeing the sheet music, you can click the picture here or the link below. I’ve re-worked the arrangement for each of the main woodwind and brass instruments as a solo with piano. If you’re interested, you can find them in my book Sacred Airs. The latest version I’ve prepared is for solo voice and will included in my upcoming book of hymn arrangements for solo voice. Though not as elegant musically as “Lead, Kindly Light,” Hymn #98, “I Need Thee Every Hour” is another favorite of mine. It is much more square in format and texture. It also harks back to an era of early American Christian Revival hymns, though it was composed a few decades after the standard revivalist time period (1800-1830). The simplicity of the tune, the harmony, and the pleading prayer are what I love about this hymn. Especially the repeated pleading. There’s not much to say about the music. It’s very straight forward. The melody has a nice lilt to it. The range is very small, which makes it easy for congregations of all types to sing it. And it brings a certain unity to the congregation as we all gather together in our common need for the Savior, His grace, His redeeming love, His guidance, His forgiveness, His peace, His salvation. I’ve recently written an arrangement of this hymn for the new vocal book I mentioned above. It starts in a very lost kind of atmosphere. We’re not even sure if we’re in a major or a minor key. It wanders around for quite a while in the dark before it find the Lord’s helping hand. You’ll have to wait for the book to come out to get a peek at this one. But that’s the power a great hymn like #97 or #98 can have. It can be the little flicker of light in the darkness we need to help us. I experience that during challenging times on my mission, during graduate school, when I was far away from my family in Poland for a year, while sitting many long days in the hospital with a terrifyingly sick infant, and in other moments of darkness. When I think about writing a hymn, I focus all my energy on writing something that can accomplish this kind of turning-on-the-heavenly-lights. A hymn can be the vehicle the Spirit rides on that can bypass our brain and get deep down into our hearts. As you write, make sure you have a high goal like this one at the core of what you’re doing. Every musical decision should be made to serve this core goal. A hymn that can do that, even if the building blocks are very simple, is a roaring success. P.S. If you haven’t yet, click the green button below to be notified when the first volume of my new book is ready. I’ve changed the title slightly. It’s really the subtitle that’s different. Writing the ‘Songs of Redeeming Love’: A Latter-Day Practical Guide for Composing Hymns and Primary Songs. The word “practical” is the new part. This won’t be a theoretical book. It will be very hands on and practical. I’ll talk about the tools you need to write a hymn or primary song and show you how to use them. Then I’ll demonstrate how I use the tool to write my hymns. It won’t be like a boring college theory textbook. Nobody like those. You can use those to increase your knowledge if you wish. My goal is to get you writing and feeling like you know what the tools are, how to use them, and see how others have used them successfully. And here’s that big green button I mentioned. P.P.S. Can I ask a favor? If you’re enjoying these posts and you think others would enjoy them, would you mind sharing them on your Facebook or other social feed? I’d really appreciate that. I’m trying to spread the word and help as many people as I can. Thanks a bunch! You can also click the “Subscribe” button below and share the link with friends if that works for you. I really appreciate your help! This hymns is found in many hymnals and is a somewhat popular devotional song. The text was written during a particularly trying time of poor healthy for John Henry Newman. His response was this plea longing for heavenly light and comfort. The tune came to John Dykes as he was strolling along one of London’s busiest streets. He specifically had Newman’s text in ming, and the tune name is Latin for “kindly light.” I very much like this text and tune as a hymn and think it is a very good hymn. The tune is memorable, and the text poignant. The suggested tempo for this hymn is good, though I would play in the upper range of the suggestion. It looks like I would choose half note equal to 66-68 beats per minute. There is a strong danger to play this hymn too slow. This should be avoided at all costs to maintain the integrity of the tune and the meter in two. I would seek to use the a more subdued and calm registration. Another subjective hymn that has wide appeal and popularity across Christendom. I think it a very effective hymn with a simple yearning highlighted by a pleading tune. It makes for a very wonderful devotional hymn. I think the setting for men (Hymn #334) is especially fitting for use, especially when sung a cappella. There are several very fine arrangements for organ of this hymn. Dale Wood, David Chamberlain, and Doug Bush all have very fine arrangements of this hymn that I use often. As with many devotional hymns, there is a strong tendency to let the tempo drag. Soft and reverent are not synonymous with slow and boring. I would take this at the very top of the suggested range or slightly faster, usually between 72-76 beats per minute. That keeps the music going, but is still more penitent in spirit. I would also use a subdued and calm registration for this hymn. Possible Final Verse Additions: I probably wouldn’t make any.